Bonnie Friedman was a young mother when her once robust husband had his first heart attack. 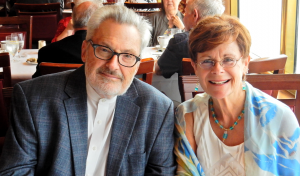 Over the past 25 years she has helped Bob navigate through 14 hospitalizations and several surgeries. The book draws on her personal experiences, research and Friedman’s interviews with health care professionals, including doctors, social workers, and nurses. Q: What was your life like before your husband Bob experienced a series of life-threatening illnesses? Friedman: Before Bob’s heart attack in 1990, our lives were like many other working families. We had two children — twins –our careers, a mortgage, busy schedules and a beach vacation once a year. We were living in Silver Spring, MD — outside Washington, D.C. — and going about our lives day-to-day, trying to keep up with the kids’ needs as well as our own. It was a pretty typical, middle-class, suburban life. We had no immediate family living nearby, something I missed while the children were young, and we were struggling with child care, the terrible two’s and all the other challenges of raising two at once. But I missed the closeness of family even more when facing Bob’s illnesses alone. On more than one occasion, my sister and her husband came to help. More often than not, it was friends who stepped in to provide support, help with the kids, meals and other needs. Q: Did you have any experiences with hospitals? Spend as much time at the hospital as you can. Get help quickly if the patient needs it. Keep a nice box of chocolates in the room so all the nurses will stop by regularly. That was my early learning, but it was a good start. As my parents aged, and my mother was no longer able to advocate for my father, I started to learn a little on my own. But nothing really prepared me for all I would need to learn and do as Bob faced his series of health challenges. What’s more, hospitals and health care have changed so much over the years and are more complicated and complex than ever. Friedman: For many years, without realizing it, I was building a wealth of knowledge about hospitals and health care. Each time Bob was ill, I picked up where I had left off the time before and learned in fits and starts what I needed to know going forward. How to read lab results, communicate with doctors, understand Medicare—these were, in sense, chapters in my learning. After Bob’s last hospitalizations in 2013—lasting almost three months—I realized that I had a depth and breadth of understanding that I didn’t have before. And I had a passion to share it. Giving back has always been part of who I am, and I’m a writer at heart. So writing a book to help others became my driving force. Hospital Warrior is the book I wish I had over the years to help me get the best possible care for Bob. Q: You interviewed nurses, doctors and even a social worker – National Association of Social Workers member Kathy Seng Gurland. How long did it take you to write the book and why do you think it was so important to include the views of so many health professionals? Friedman: It took about two years to write the book. That included research, writing and interviews. The interviews are very important because they introduced a variety of perspectives from experts including doctors, nurses, social workers, hospital administrators and lawyers. I have a lot of hands-on learning but am still a lay person when it comes to health care. So I learned a great deal from the interviews. Talking to Kathy Gurland about discharge planning was one of the more eye-opening interviews in the series. She taught me a lot. The interviews also provided credibility for the book and assurance for my readers that they would be getting the best advice I could provide, not just from my perspective but also from those with professional experience and expertise in their fields. In that sense, Hospital Warrior is a really good mix of personal and professional advice that blends wisdom with practical know-how. Q: What has been the reaction to this book and how do you think social workers should use it? Friedman: The reaction to the book has been very positive. People often tell me how needed it is and that everyone should read it. The Washington Post recently provided a favorable review. Most of us will have a loved one in the hospital someday. It is not only a concern for seniors. I started advocating for Bob when I was 39. Others need to help siblings or aging parents. “Hospital Warrior” can be read for future planning, like a fire drill, or it can be used as a guidebook when someone you love is in need. Most hospital social workers have too many patients and not enough time. They can use Hospital Warrior to help patients and their families plan and prepare for discharge. The more the patients and families know, the better prepared they can be to work effectively with social workers to ensure a smooth discharge process and minimize the chances of readmission. Q: How can folks get a copy of “Hospital Warrior”? 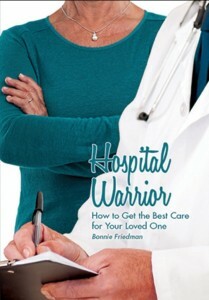 Friedman: Hospital Warrior is available on Amazon in both paperback and Kindle formats. Social workers help people overcome serious challenges, including navigating health care systems and recovering from illness. To learn more visit the National Association of Social Workers’ “Help Starts Here” website.